The Helix cork and bottle has a thread finish that allows drinkers to twist the stopper open and closed again, creating an airtight barrier. 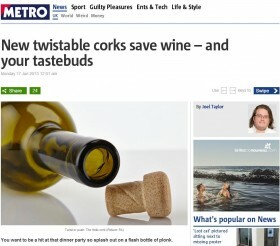 Its makers say it banishes ‘cork taint’ – the sour, musty taste that ruins wine. The Helix is the result of a four-year partnership between Portuguese cork manufacturer Amorim and US bottle maker O-I, which is aiming it at the £5 to £10 market. O-I Europe president Erik Bouts said the response in tests with connoisseurs was ‘overwhelmingly positive’.